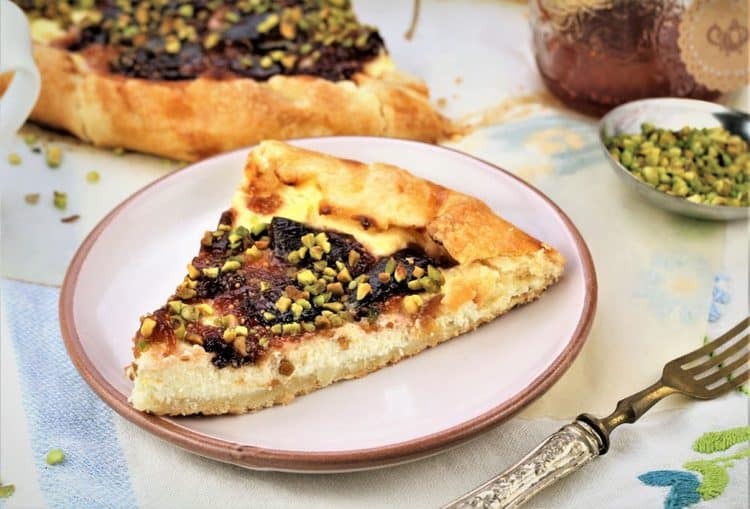 Fig Jam, ricotta and pistachios, three ingredients quite common in Sicilian cooking come together to make a simple yet elegant crostata! Fall is in the air, do you feel it? The kids are back in school, the days are becoming shorter and the geese are flying overhead. As my daughter says, it even smells like fall! I miss summer already but the one redeeming factor in all of this is how much I love fall cooking. This is the perfect time to give in to our desires for cozy, comforting dishes! This time of year makes me to want to bake, which doesn’t happen often. 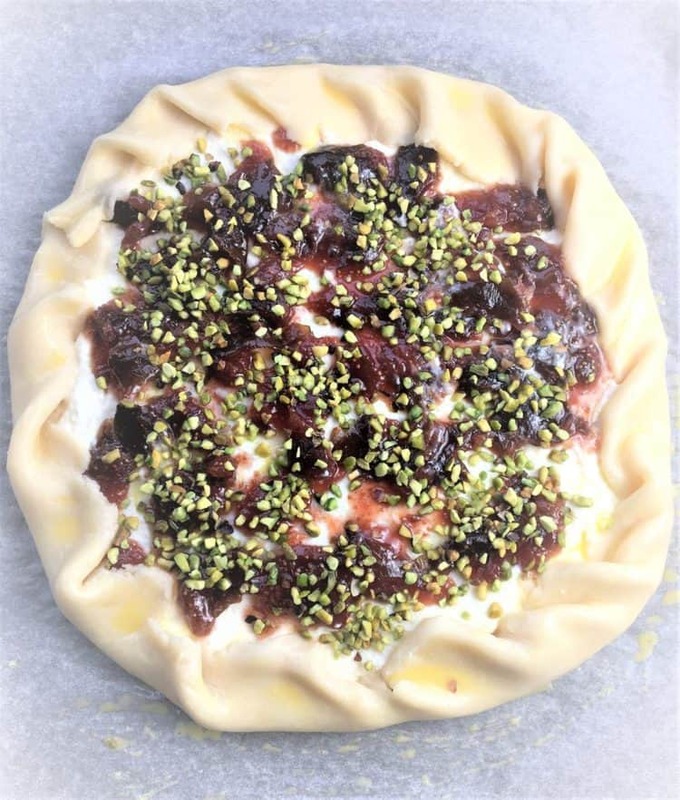 In fact last week my kids and I baked a pumpkin pie along with this Fig Jam, Ricotta and Pistachio Crostata. Who says we have to wait until Thanksgiving! This recipe was inspired by a lovely jar of fig jam given to me by my dear friend Liliana at My Cookbook Addiction. This summer I was in Sicily way too early to enjoy freshly picked figs so I was thrilled when Liliana presented me with this homemade fig jam. I’m not a fan of toast and jam so I got right to thinking of how to use it in a recipe. 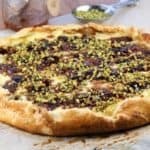 Figs, ricotta and pistachios are all key, typical ingredients in Sicilian cooking. I decided to incorporate all three in a dessert that I am particularly fond of, crostatas! You can tell how much I like them as I have two other crostata recipes on my blog: Strawberry Rhubarb Crostata and a savoury Butternut Squash, Goat Cheese and Leek Crostata. I loooove making crostatas because they are so easy and forgiving, especially if you’re not fond of making pie dough. You can check out my Butternut Squash, Goat Cheese and Leek Crostata for some tips on making an easy crostata dough. When the dough has chilled, simply roll it out into a circle and top with the ingredients. I chose creamy, sweetened ricotta flavoured with orange zest as a bottom layer. Next, I spread fig jam over the ricotta. This jam had a chunky texture, which I actually prefer since you get to bite into small chunks of the figs. I used my fingers to dot the ricotta with the jam. Next, I sprinkled chopped pistachios over the filling. I was fortunate to bring back pistachios from Sicily grown in Bronte, located at the foot of Mount Etna. Pistachios are like green gold nuggets in Sicily. I love the contrast in color between the fig jam and pistachios as well as the crunch when you bite into them! Finally, fold the dough over the filling as shown. The shape doesn’t have to be perfect and the edges don’t have to be accurately crimped. It will nonetheless turn out beautiful! Brush the crust with a beaten egg, bake and enjoy! Since I’m not a huge dessert lover, a small wedge of this crostata is the right sized dessert portion for me! I hope this recipe helps ease you toward fall, comfort food cooking. After all, Thanksgiving is right around the corner. Let me know what you’re cooking and baking this fall, I’d love to hear from you. If you try out this recipe, please do tag me on Instagram or Facebook with @mangiabedda or #mangiabedda. Buon appetito! 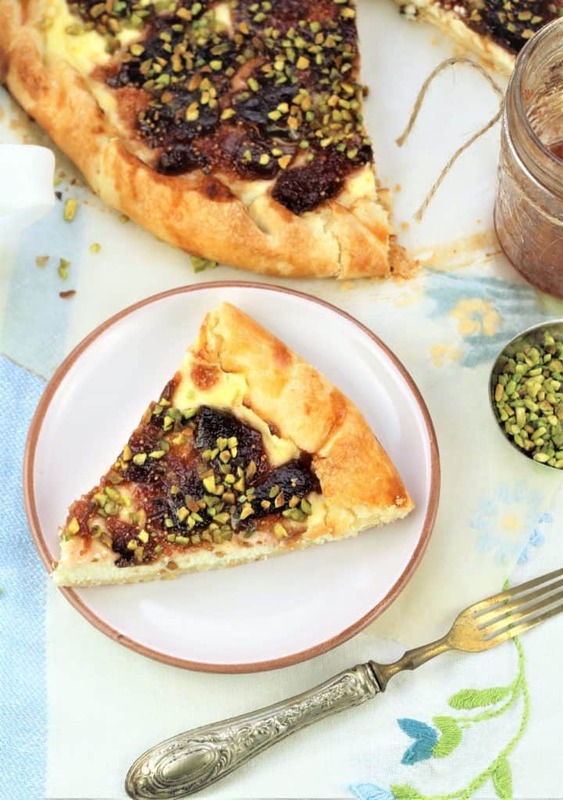 It's beginning to look a lot like fall and it's time to bake this easy Fig Jam, Ricotta and Pistachio Crostata. This recipe is inspired by key ingredients used in Sicilian cooking. In a food processor fitted with a steel blade, add the flour, sugar, salt and butter into the bowl. Pulse until the butter has broken down and is the size of peas. With the motor running, add the ice water through the feed tube. Pulse until the mixture resembles a crumbly dough. If the dough is too crumbly add a bit more water. Turn out onto a lightly floured surface and shape into a disk. Wrap in plastic wrap and refrigerate for about half an hour. In a medium-sized bowl combine the ricotta, orange zest, sugar and egg. Stir to combine. Preheat oven to 400F. Remove the dough from the refrigerator and roll out on a floured surface into a 14 inch circle. Carefully lift and place it on a parchment paper covered baking sheet. Spread the ricotta mixture in the centre of the dough, leaving a 1 1/2 inch border all around. Spread the fig jam over the ricotta. Sprinkle the filling with pistachios. Fold the border over the filling, gently pleating it into a circular shape. Brush the dough with the beaten egg. Bake for 35 minutes until the dough is golden. Transfer to a wire rack and let cool completely before serving. For best results, make sure your butter is well chilled before adding to the flour. If the dough is crumble and too difficult to roll, shape into a disk once again and refrigerate for a while longer. Nadia this is definitely my type of dessert as well! 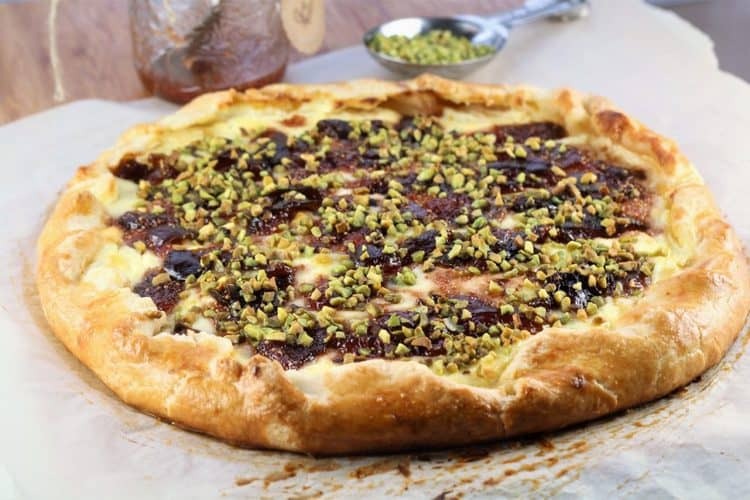 From the crust to the sweetened ricotta filling topped with fig jam and pistachios...it makes me want to devour it! Thanks Marisa, it is definitely the combination of some of my favourite ingredients. Especially ricotta! I am going to make this crostata. 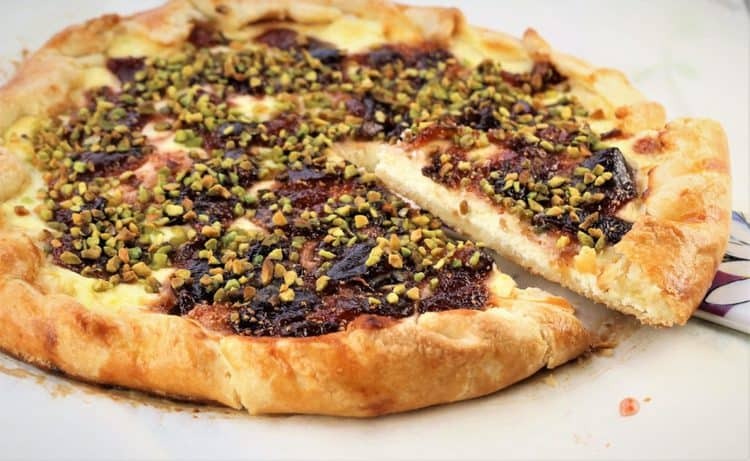 Ricotta, fig jam and pistachios definitely sound like a great combination! I’m glad I gave you that jar of fig jam???? Thanks to you for inspiring me with that delicious jam! Mmm, ever since I tasted my first fresh fig years ago from a tree that my parents grew, I can't get enough of them, and always have to buy fresh figs when I see them, though none have ever tasted as sweet. Using the luscious jam in a crostata like this one seems like it might be close, though! Beautiful photos, too. My father also had a fig tree which he would bury in the ground each winter! But I never appreciated gigs until my first trip to Italy at the age of 20 where I had the pleasure of eating them straight from the tree. I was hooked! 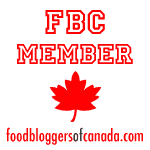 So we’ll have to content ourselves with fig jam here in Canada! Thanks Margaret!